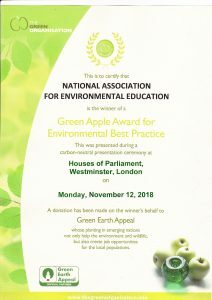 NAEE received a Green Apple award at a ceremony at the House of Commons last week at the 2018 International Green Apple awards. In particular this was in recognition of its project which provides bursaries to schools in Birmingham and the West Midlands. These allow young people to visit environmental study centres and link the visits with the development of environmental work across the curriculum. Known as Kenrick Days, the grant funding has been provided by the family of the late Hugh Kenrick, a noted environmental philanthropist from Birmingham. The award also cited the unique journal Environmental Education which NAEE has been publishing for over 50 years. Here’s what Nina Hatch, NAEE’s Executive Chair, has to say in a recent blog about the award and the ceremony at the House of Commons that was held last week. The 2019 ASE conference in Birmingham will have an ESD pathway which NAEE is contributing to. Our two sessions [Teaching Secondary / Primary Environmental Education Through STEM] will explore how STEM subjects can enable students to learn about the key environmental issues that we face. We shall use NAEE’s recent teacher handbooks, The Environmental Curriculum, and the sustainable development goals (SDGs) to help us do this using a mix of input and small group discussion. The full programme is here. Chris Willmore is giving her inaugural professorial lecture at Bristol University on Nov 28th (1730) in the Wills Memorial Building. In this Chris will be discussing the role of universities in delivering a more sustainable society, exploring the role of institutions, academics and students, posing the question of what we can all do to harness the energy and creativity within these institutions to assist in the transformation we need. It will focus in particular on how we can get young people engaged in what is going on to transform our cities and communities. There is no charge and you can register here. The Company will be touring theatres and festivals from May and are also very keen to hear from any schools who think a performance and workshop would go down well at their setting. You can email jacquelinemakeshift@hotmail.com if you would like a performance for your school. It’s almost too late to meet the deadline for tendering for the Defra research Exploring the feasibility of a natural environment programme to encourage use of natural environments by disadvantaged children and young people (it’s on 21st November). This study will review current provision of opportunities to encourage children and young people (aged 5 -20) to make use of the natural environment. The results will inform decisions on any future role for Government in supporting the increase of opportunities for disadvantaged young people to experience a range of natural environments, learn about how natural environments can benefit them (for instance in terms of health and wellbeing), and participate in social action related to the environment. NAAEE says its 2019 conference will take place in Lexington, Kentucky from October 16 to 19. The Research Symposium will be from October 15 to 16. See you there, perhaps.